Portioning levain dough at the Manresa Bread production site. 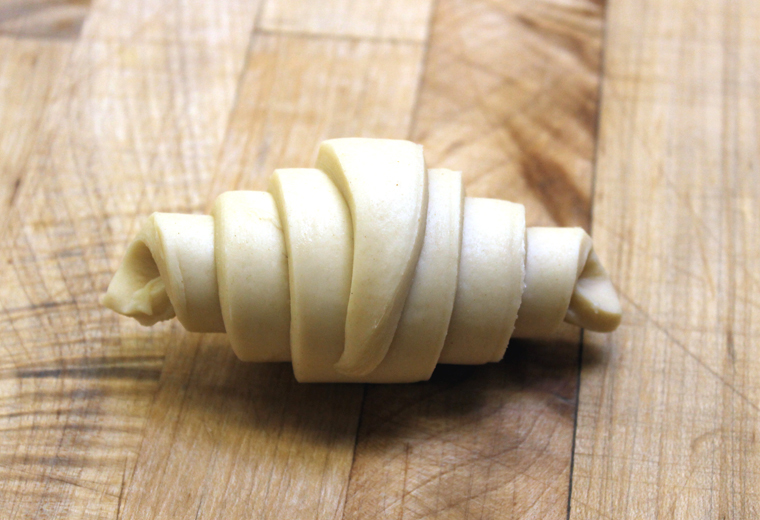 Spoiler Alert: That flaky, golden croissant you can’t wait to dig into at Manresa Bread consists of 1 part dough to 3 parts butter. Maybe more than I wanted to know, too. 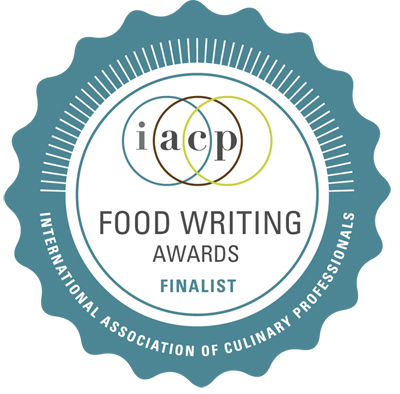 But at least I’ll own up to the fact that it still won’t stop me from nibbling on them any chance I get. 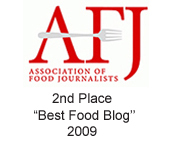 Which is exactly why I didn’t turn down an invitation to be part of a small group of media to visit Manresa Bread’s 3,400 square-foot production kitchen in Los Gatos last week. The facility bakes the goods for both Manresa Bread retail locations in Los Gatos and Los Altos, as well as for Manresa restaurant in Los Gatos, The Bywater restaurant in Los Gatos, and its stands at the Campbell and Palo Alto California Avenue farmers markets. You smell the unmistakable aroma of yeast the moment you walk through the doors of the production kitchen. At a large wooden table, two bakers weigh and portion dough for the bakery’s crusty levain loaves. 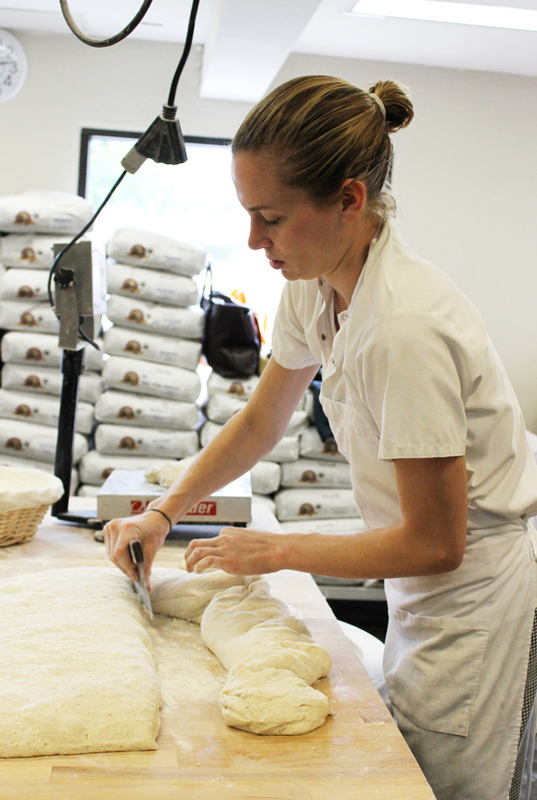 It’s hard to believe how quickly Manresa Bread has grown. 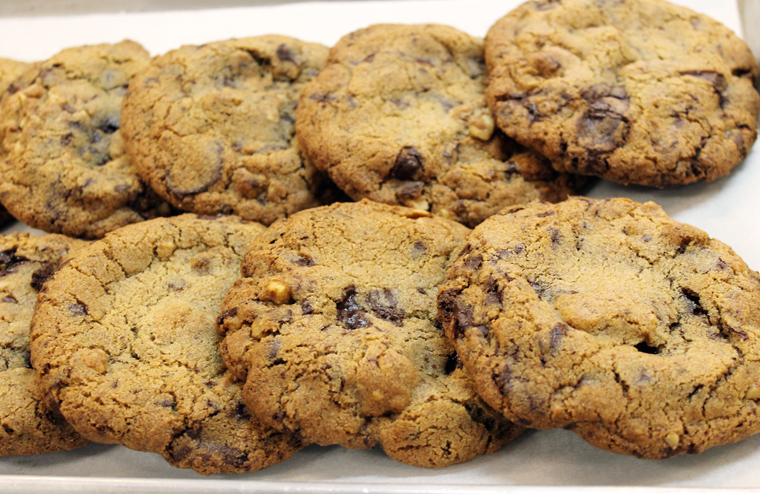 It opened its first bakery in 2015 in Los Gatos, followed a year later by the Los Altos one. Its pastries also are sold at Verve coffee cafes in the Bay Area. Twelve people work on the production side, along with five drivers, and 14 employees on the retail side. Nowadays, Manresa Bread sells upwards of 2,000 pastries on a typical Saturday, and as many as 1,200 loaves of a bread on a Sunday. Everything is shaped by hand, too. 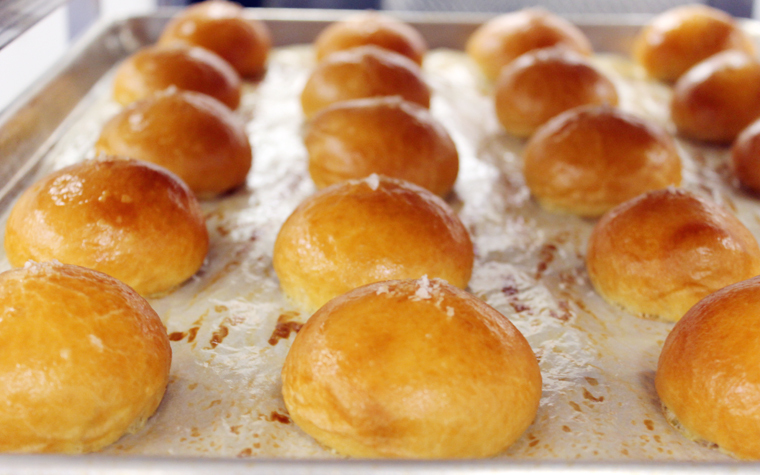 Brioche buns delivered to Manresa restaurant each day by 4:30 p.m.
About those croissants? Anywhere from 300 to 1,000 are rolled each day. First, the laminated dough is marked with a special roller, then a baker takes an X-Acto knife and ruler to cut them precisely. 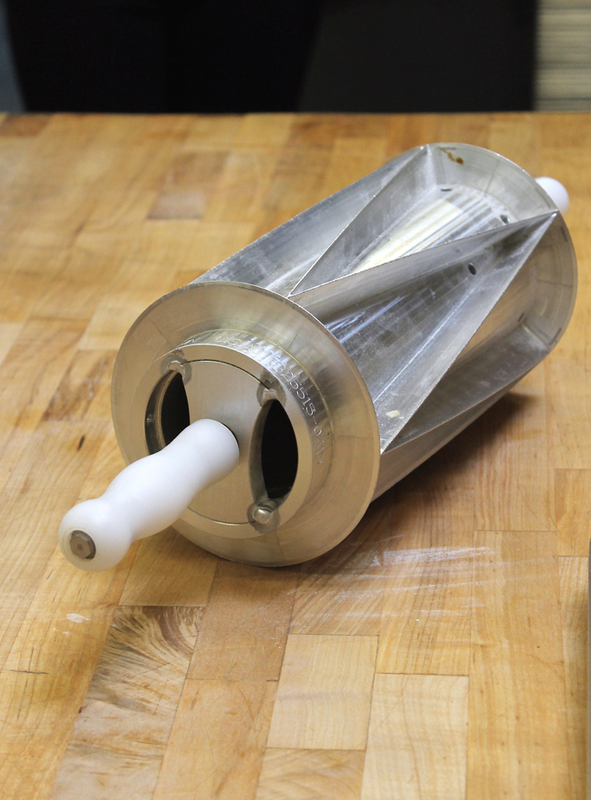 The roller used to mark croissant dough. 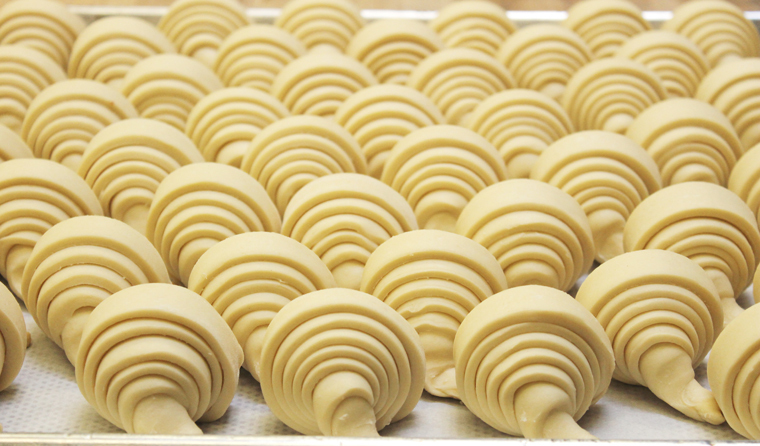 Croissants all rolled by hand. My attempt at rolling one. Ruzika is so obsessed with getting the details right that each day, she mills the flour and polenta from organic grains. The bakery does buy white organic and higher gluten white flour elsewhere. But the specialty grains are milled fresh every day. Freshly milled grains also are more challenging. “They absorb water differently, and they ferment differently. They are more active,” she says. 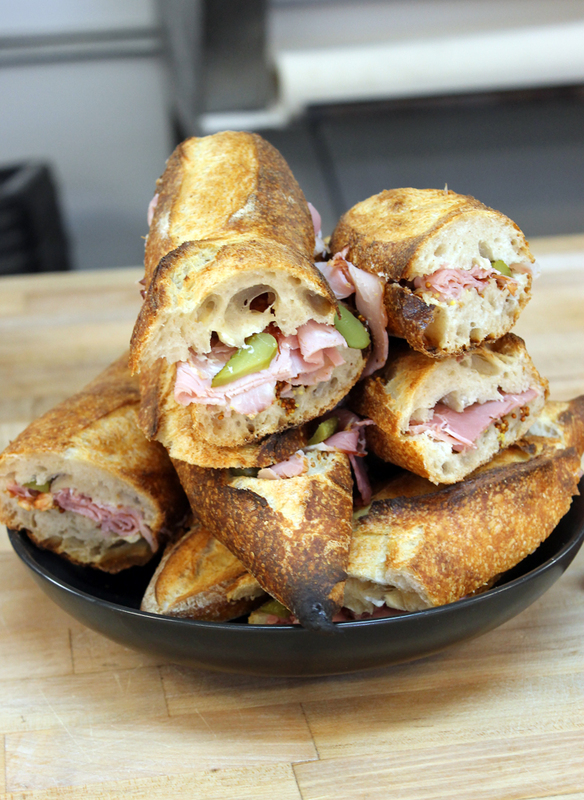 This summer, look for ham and cheese baguette sandwiches garnished with butter and cornichons on the menu at both Manresa Bread locations, for about $8 each, which we got a sneak-taste of. Ham and cheese baguette sandwiches. The crust is incredible on these quiches. 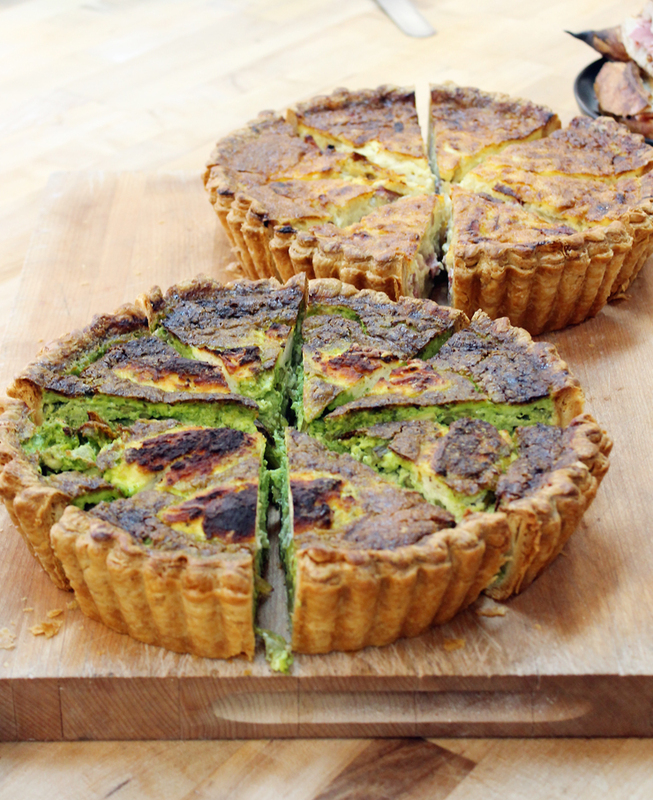 We also sampled the quiche Lorraine and a seasonal quiche with asparagus and pesto. Their foundation is a puff pastry-like dough, making this quiche crust some of the flakiest and butteriest around. It’s like a perfect piece of pastry in an of itself. Slices at the bakery are available for $8 each. Manresa now also ships its bread throughout the continental United States, as well as its supersized 8-inch diameter kouign-amann, which will serve 6 to 8. 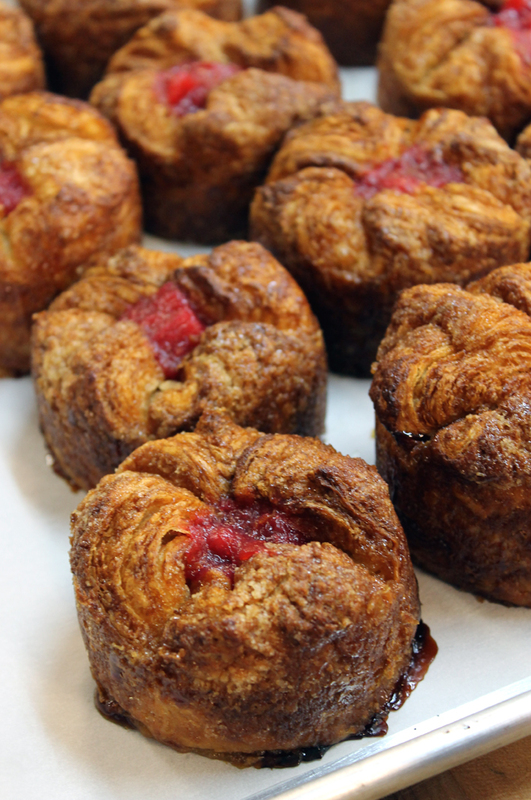 Spoiler Alert: That big kouign-amann will actually keep fresh for a week, owing — ahem — to all the sugar in it. But don’t think about it. Just enjoy. So amazing how she handrolls the croissants in such perfect size and shape every time. I guess when you make so many every day you get a hang of it. 🙂 And yes, sometimes knowing too much about the inside can spoil things, but it’s all good in moderation! True edible works of art! I love your bakery in Los Gatos . Are the breads and pastries all/ completely organic ingredients? I still have a confusion about that. eggs in the quiches etc? 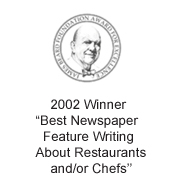 Do you serve any organic dishes at the Campbell restaurant? 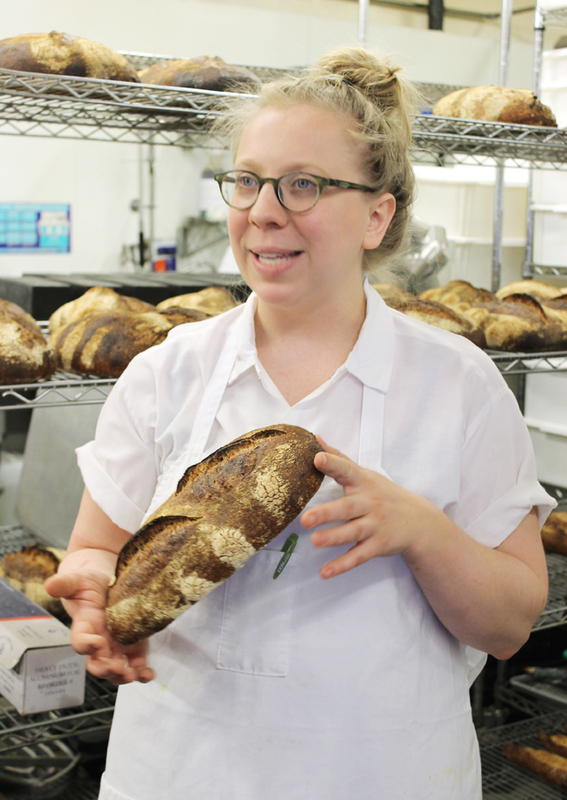 Cindy: The publicist for Manresa Bread told me, “The majority of Manresa Bread’s ingredients are organic, with a few exceptions. There are some ingredients that Manresa Bread can’t buy organic in the format they need, like sheet butter. Regarding the produce they buy, Manresa Bread asks a lot of questions of their purveyors. Some of the smaller farms they buy from haven’t been certified organic but don’t spray.” I hope that answers your questions.